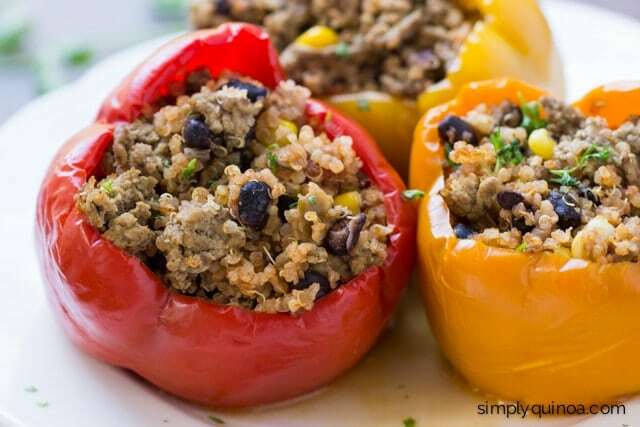 This crockpot stuffed peppers with quinoa recipe make for a perfect weeknight meal. They’re easy to prepare, taste delicious and are filled with lots of healthy protein. It’s hard to believe that summer is coming to an end. It went by too fast as it always does, but even though I know I’m going to miss it like crazy, part of me is always excited when fall arrives. Kids head back to school, we’re back to work on our regular schedules again and our lives tend to get a bit more hectic. I know it doesn’t sound all that fun, but there’s something really energizing about it. Plus, it also gives me an excuse to whip out my crockpot again. I’m totally not a crockpot-in-the-summer kind of person. To me, summer is all about not cooking (or cooking outside). Things like fresh salads, grilled fish and summer barbecues are the norm in my house. But as soon as back-to-school season comes, I’m thinking about my crock pot again. Not only for the warm, hearty meals that my body starts to crave, but mainly because it just makes life so much easier. Coming home to dinner already cooked? Yes please! Typically, I’m more of a stew/chili person when it comes to crockpot cooking, but this year I’ve told myself that I need to be a bit more adventurous. First up? 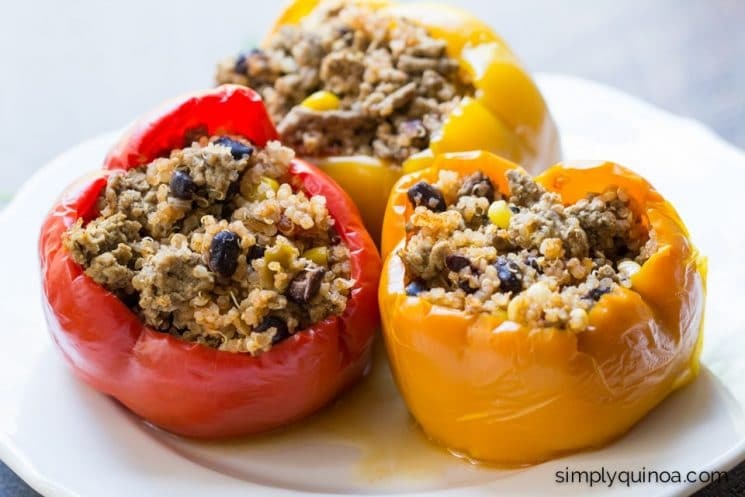 These deliciously simple crockpot stuffed peppers. I’ve always loved stuffed peppers, but they aren’t something I make very often because they seem to always take longer to make that I anticipate. So when I figured out you can make them in a crockpot, I practically jumped for joy. And honestly, they couldn’t be any easier to make! You just make your filling, stuff the peppers, put them in the crockpot and walk away. Talk about the perfect weeknight meal. 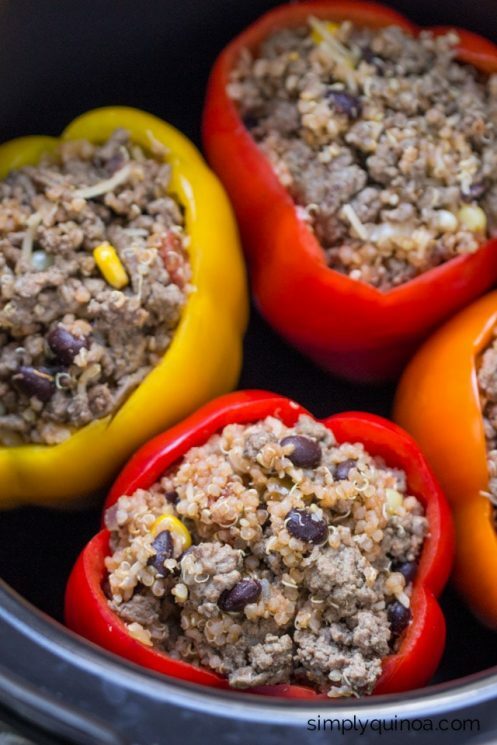 For the filling for these stuffed peppers, I opted for a Mexican/Southwestern theme, going with a blend of my Mexican quinoa, a little ground beef and sharp cheddar cheese. It’s simple, quick and super tasty. 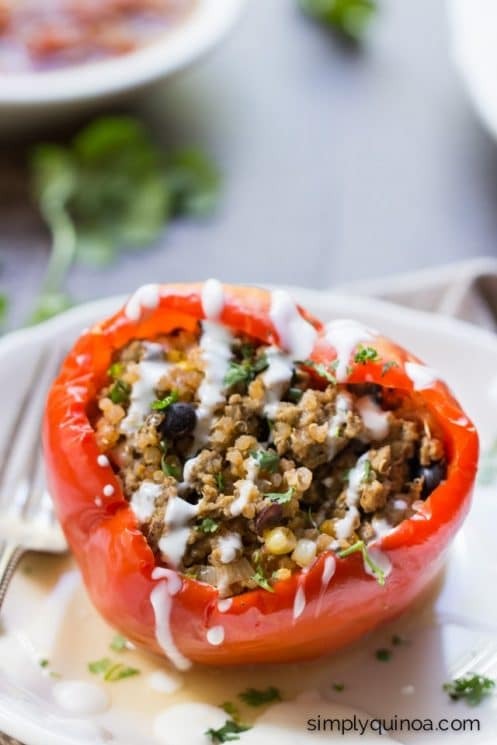 For the meat aspect of it, you can use ground beef like I do in this recipe OR you could certainly use ground turkey, chicken or even crumbled up tofu for a vegetarian option. Go with whatever your family enjoys most (or that you have on hand!). And finally for the cheese. Again, feel free to make some changes. I used cheddar, but you can swap in your favorite shredded cheese – either traditional dairy based cheese or a vegan/non-dairy option if you’d like. Honestly, you can probably just leave the cheese out all together if you like as well, the dish will still be delicious! So I guess my point is, have some fun. Use what works for your family – the quinoa is a great base and you can kind of play from there! I chose to garnish mine with a little cilantro and sour cream, but it would also be amazing with some salsa or guacamole. Basically, the goal is that this can become a go-to dish for your family where you can mix and match different ingredients depending on what you have on hand. And most importantly, they’re easy! It doesn’t get any better than that. Alyssa is the blogger and cook behind Simply Quinoa, a gluten-free website dedicated to healthy food, always with a little quinoa twist. 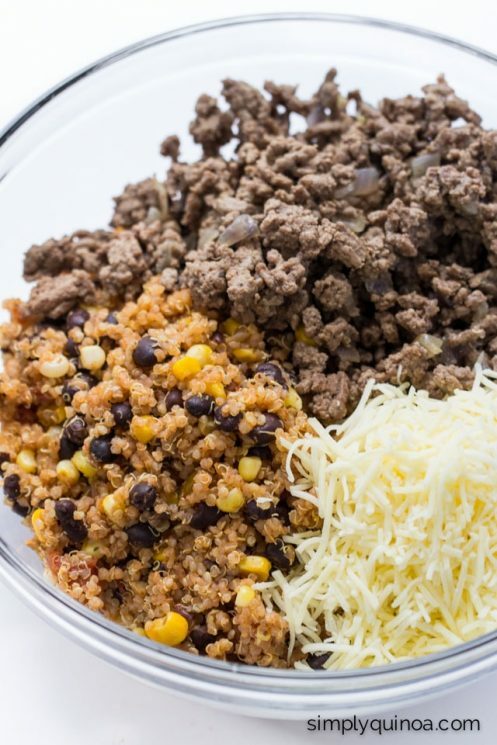 Prepare Mexican quinoa according to instructions in this recipe. Add to a large mixing bowl and set aside. Heat a skillet over medium heat and add the onions. Saute until onions have started to soften, about 1 – 2 minutes and add the ground beef. Cook beef until browned, breaking it apart with a wooden spoon as it’s cooking, about 5 minutes. Season with salt and pepper. While beef is cooking, prepare the peppers. Cut the tops off the peppers using a small knife and remove the stem and seeds. Reach inside and pull out any white bits that might remain. 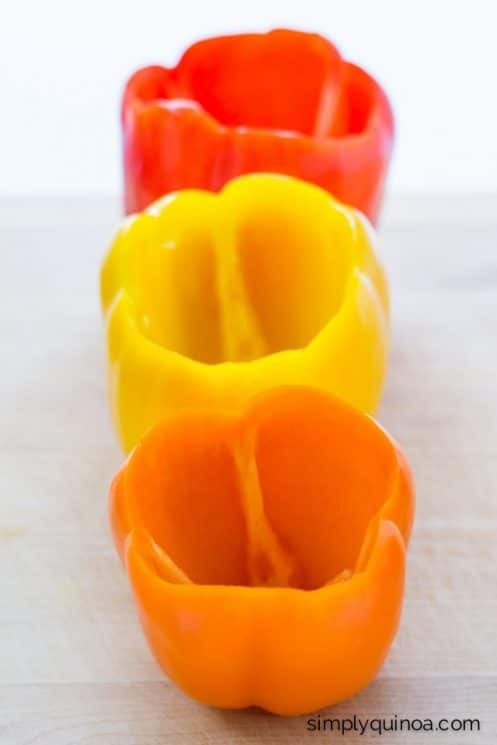 If the peppers are not standing up on their own, slice a very small amount off the bottom to even it off (you don’t want the bottoms to have holes in them, so slice as little off as possible). When beef is done cooking, remove it from the pan using a slotted spoon and add this to the mixing bowl with the quinoa. Add cheese and stir everything to combine. 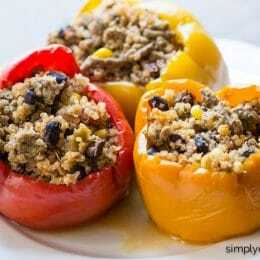 Completely fill each pepper with this mixture and add them to the crockpot, with the peppers standing upright. Pour broth into the pot, being careful not to pour it on the peppers. Cover and cook on high for 4 hours (or low for 6 – 8). When ready to serve, remove top and let cool for 5 – 10 minutes. Transfer peppers to plates using a slotted spoon and garnish with desired toppings. Hi there. These look great. When I usually make stuffed peppers I put in raw meat and cook in the oven. What is the reason for cooking the meat first? Thanks!